This sword belongs to Yasumitsu ranking. Blade length :　73.1　cm or 28.77 inches. Sori : 2.1 cm or 0.82 inches. Width at the hamachi : 2.91 cm or 1.14 inches. Width at the Kissaki : 1.79 cm or 0.70 inches. Era : Early Muromachi period. 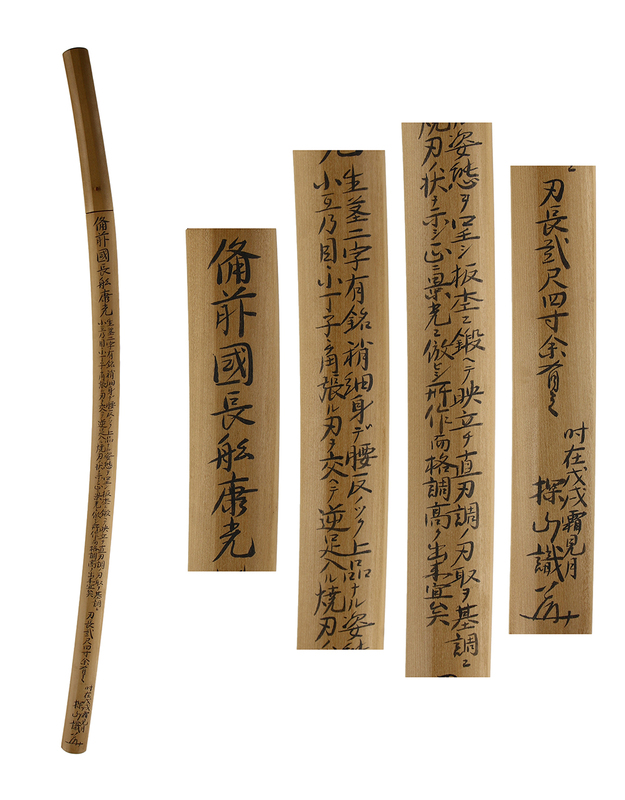 Shape : Regular width and thickness Katana with large Sori. Ubu Nakago Tachi style Katana.There are Bo-Hi on both side of the blade. Jigane : The mixture of Itame Hada and Mokume Hada with Jinie.There are Chikei, Utsuri. Special Feature : Yasumitsu was active in early Muromachi period. It is possible to say that he was a leading sword smith of Ouei Bizen. Especially the Jigane is so nice. The Katana size swords are few in number. Tsuba : Shakudo Nanako Tsuba, Kiri Mon are engraved with open work. On the rim, there is a dragon is engraved with gold color. 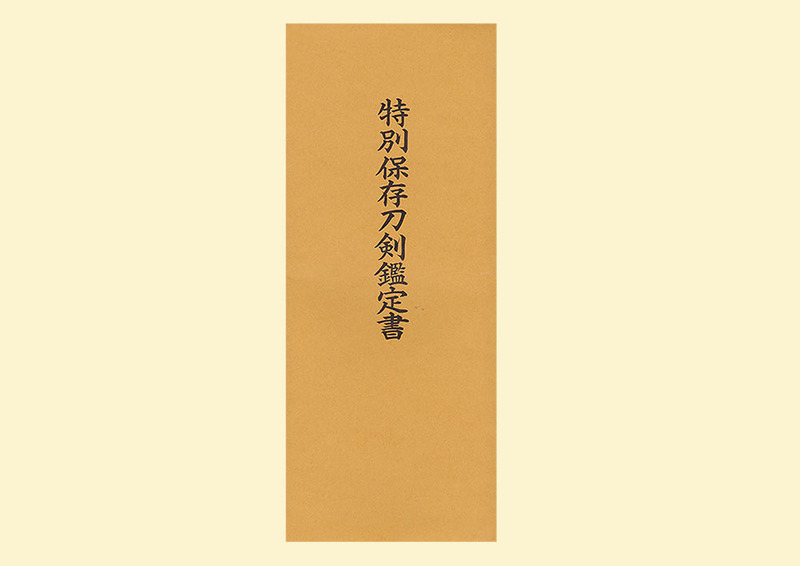 Fuchikashira: Shakudo Nanako, family crests are engraved with gold color. 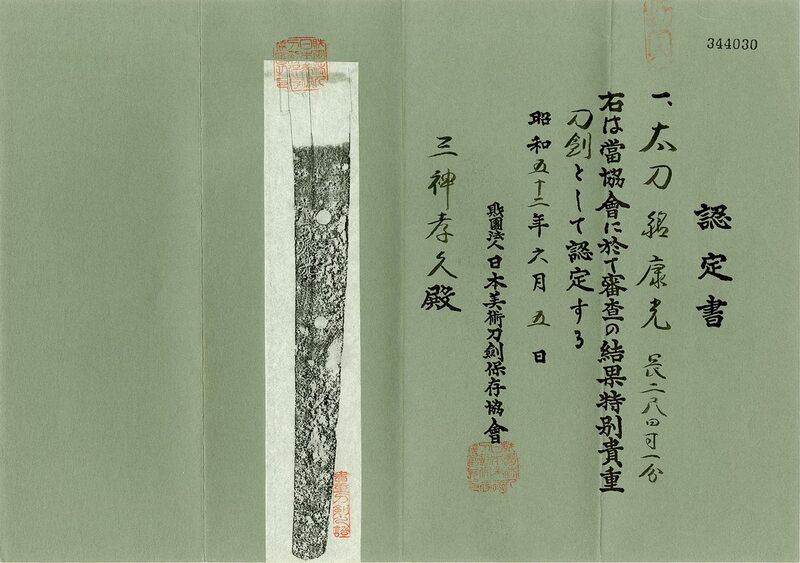 From Aoi Art: Yasumitsu could be considered a sword smith representative of Ouei Bizen. Most his swords are Tanto and Wakizashi. This Katana length is 73.1cm. The shape is elegant. The Nakago is Ubu. We recommend this rare long Katana for you.